Since this is my last post before Christmas, I thought I would include another Christmas Drama that I wrote. All of the dramas I write are non-traditional, but this is non-traditional in a couple of ways. First, it tells the Christmas story, but not in the standard way. If you read the script, you will see that it starts with a stage that has a stable filled with hay. 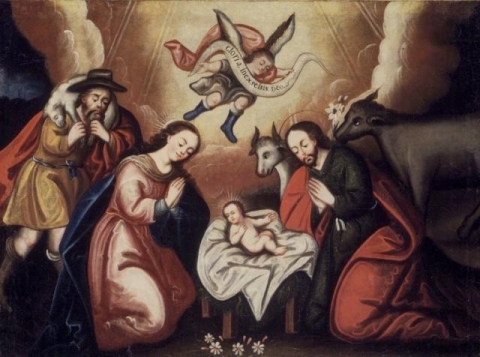 This gives the illusion that the congregation will be seeing a standard depiction of the nativity. It even begins with an innkeeper sweeping the floor. A knock is heard, and the innkeeper says that there is no room. The person outside persists, saying that his companion needs help. When the innkeeper answers the door, however, two men walk in. The audience learns that the men are Saul of Tarsus and his traveling companion, Shemaya. Saul has been struck blind and is making his way slowly to Damascus. However, they need to get out of the terrible weather. The innkeeper eventually agrees to let them stay in his stable, and that’s where they go. When the innkeeper brings them blankets to help make them more comfortable, Saul speaks for the first time. In the discussion that follows, the innkeeper learns about Christ’s crucifixion, resurrection, and birth, in that order. Along the way, the audience learns that this is the same innkeeper who (when he owned an inn in Bethlehem more than thirty years ago) sent Mary and Joseph to his stable. He has been suffering from guilt about that, and he ends up finding forgiveness and joy as a result of Saul’s visit. The play is also non-traditional because it uses some multimedia. The story of Christ is told through “flashbacks.” Sometimes, the flashbacks contain singers who are supposed to represent people from the past. A teenage young lady, for example, sings “Be Born in Me” as Mary. Later, she and a teenage young man (playing Joseph) care for a baby in a manger. Some of the other flashbacks, however, use singers in modern dress and a slideshow that depicts the event being presented. For example, to tell the story of the crucifixion, two singers in modern dress sing “The Power of the Cross,” while a slideshow presents several pieces of art that depict the crucifixion. Two of the flashbacks don’t even use live people. They are just YouTube videos. The combination of the way the story is told and the incorporation of multimedia make the drama very non-traditional, indeed. Feel free to use the script in any way you think would edify the body of Christ, but if you use it, I would appreciate a credit. I saw that the videos you linked to in your skit are from Mormon youtube channels. Are you Mormon? I didn’t even notice that, Abigail. I just searched for videos on Youtube. No, I am not Mormon. I am a Protestant. I bought ‘Reasonable Faith’ from a distant recommendation in a thread about Bill Nye. Actually Dr Wile offered it free of charge as a pdf to one of the commenters. I figured that if he could give the evidence to a doubter, the least I could was buy it. So I did. And being in the UK, it took a while. But it did arrive. And oh my, I’m glad it did! This book is a work of art! It’s got everything you need for a Christian to confirm their faith; and everything for a non-believer too. It’s easy to read, really easy actually (considering the topics Dr Wile discusses). I wanted to read it for the scientific evidence, but it’s the Biblical evidence that will blow your mind! It should be a mission for any church to read this together. And for families too. I for one will be trying to get my daughter to read this masterpiece. I pray to the Lord she will. There’s no doubting the evidence presented. Thanks to you Dr Wile. It’s a stunning book, and I hope you can add to it in the years to come. For all the would-be readers… The best book I’ve ever read! I am so glad the book was helpful to you, jk! I pray that it will be a help to your daughter as well.